I am wiring up a phono stage and want to add this mono/stereo switch. There is a place for two resistors. Suggestions for resistor values (or how to calculate)? Additionally, I'd like to know your suggestions as to resistor type. Is one type preferred over another? Are we supposed to guess the circuit and thus the purpose of the resistors? Seems it comes with a selection of values in the kit. Sorry. I thought identifying it for a phono-stage would suffice. It will go after the signal passes through a RJM Emerald phono stage and before the RCA output jacks. Would have been sweet to save us all a Search. Doesn't Broskie put instructions in his kits? If not, he has generally been responsive to email. I hope the new software makes links more obvious. He doesn't have a recommendation regarding type. One can purchase either metal film or carbon film so that's why I'm asking for recommendations. There is also an option for 1% resistors but then you lose the option of type. Confusing to me. The value is also in question. I apologise for not linking to the unit. I thought it was a basic question or two. 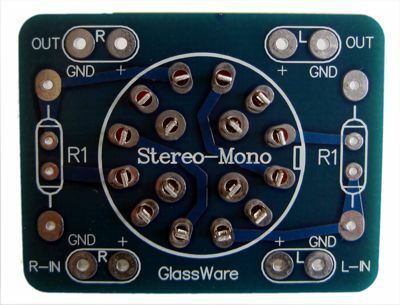 A mono/stereo switch in a preamp could in some cases be simply a SPDT which either connects the two channels at a suitable point or not. It was unclear to me why someone might need a separate PCB for such a trivial role. The fact that it is a phono preamp tells us nothing much at all. In this case it appears to be a more complicated setup meant to go after a preamp. The resistors are just there to avoid shorting the output - although a good design of preamp would probably already incorporate these internally. The value is not too critical: a little higher than the output impedance, a lot lower than the load impedance. The type does not matter too much; by design they do not do very much so they cannot do much harm either. It is the kind of question Broskie usually gives guidance on.... I'm surprised no clue comes with the kit. It is the kind of design balance that he pontificates well. They should be high enough to "not hurt" the sound when in action. Your plan shows opamps with 47r resistor build-out; we can pencil this as 48 Ohms. However depending on the opamp it may not drive large level into 2k or 300r without rising THD or outright clipping. The worst-case is out-of-phase L and R signals; however this is a rare event (sounds funny on most speakers; however this may be the case where mono is better). The LOAD matters too. If you have one of those low-low-Z power amps with 1K input (there are a few) then 1K in series significantly hurts level. OTOH a 500K input hardly cares. Taking an assumption that the preamp can drive 1K fine, and the power amp or line amp is 20k or more, 1k is a fine value. But if your preferred toasted-poppy-stem or OF-Zircon resistors only come in 789r or 1.567k, that will do too. If I had an overstock of 1k3 5% carbon-film, that's what I'd use.